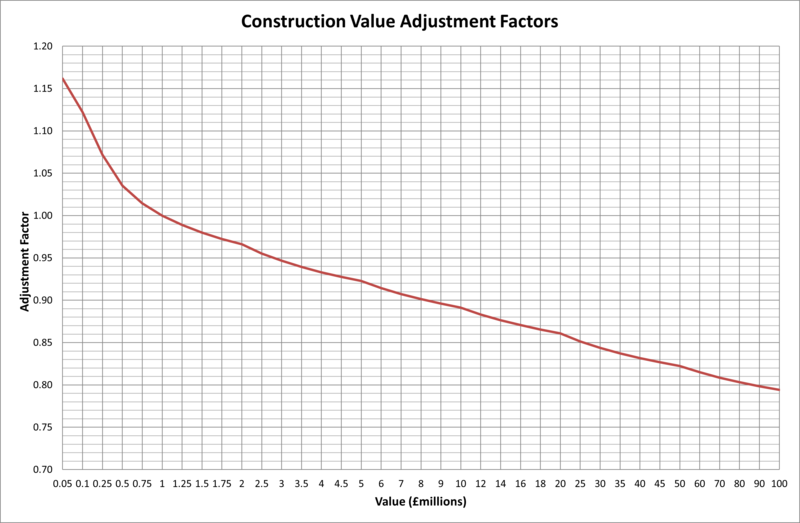 This page contains a chart indicating how the overall value of the total construction project affects construction costs. The costs differences reflect the economies of scale and efficiencies achieved as a project gets larger. For example, a £1,000,000 construction project has a cost factor of approximately 1, a £100,000 construction project has a cost factor of approximately 1.12 meaning unit costs would be some 12% more expensive, a £10,000,000 construction project has a cost factor of approximately 0.88 meaning unit costs would be some 12% cheaper. Building prices can be influenced significantly by local conditions, local market conditions and specification. The factors given here are intended only as an indicative guide and should be treated as indicative.